When I made the decision as an undergrad to pursue a minor in Anthropology instead of a double major along with History, my philosophical world view was disassembled, rearranged and pieced back together. But in a positive way. It galvanized the dissimilar and sometimes incongruent paradigms which oozed back and forth between the hard and soft science classes at the university. One of the prerequisite courses was an introduction to Anthropology of the Family. Although the course was as interesting as the professor could eek out in a 4 month stint, ultimately it proved to be underwhelming at best. By default I was able to enroll in this course but the course I really wanted to follow to satisfy my requirements was Medical Anthropology. At the time, youth was my driving force like a fire in the belly which spurred me on and didn't accept disappointment. I told myself that if I couldn't follow the lectures, so be it; but I was going to study the book and handouts which were listed. The title of the book eludes me now but the contents of the book; its basic tenets, the gist of the narrative, fascinated me to the point of obsession. Primitive cultures, now abandoned for the p.c. Pre-literate moniker, was and still is the first stepping stone in American and European Anthropology education. The early 20th century paradigm shift in Anthropology from the concept of “other” to “different” is still prevalent and woven seamlessly into today's curriculum. Pioneering anthropologists like Franz Boas taught a second generation of pioneering anthropologists to throw off the shackles of Social Darwinism and study indigenous cultures as unique and intrinsically equal cultures. Without being laden down in nominal conclusions of good and bad, anthropologists like Ruth Benedict and Margaret Mead spearheaded the Relativism movement in the social sciences. Mead's seminal work on sexuality; “Coming of Age in Samoa”, shown a light on a sexually repressed Western Culture. Franz Boas, in his forward to her book, illuminates what Mead's work represented; “Courtesy, modesty, good manners, conformity to definite ethical standards are universal, but what constitutes courtesy, modesty, very good manners, and definite ethical standards is not universal. It is instructive to know that standards differ in the most unexpected ways." This was what the textbook from Medical Anthropology was espousing at its core; knowledge and wisdom are two separate concepts which are universal to all cultures but differ in meaning within various cultures. The example which rattled my brain as most poignant and epiphanic was not from some far flung exotic Polynesian island; it was from New England USA. In the winter months when Northern climes are subject to but seldom reported epidemics of flu those areas utilize home spun remedies to combat and stave off the demoralizing secondary infections. One of those remedies is called Grog. Apparently the word grog stems from the British Vice Admiral Edward Vernon who was know as "Old Grog". The libation was formerly a mixture of alcohol and fruit juices and spices which rationed to sailors as a means of avoiding drinking stagnant water and preventing scurvy. Sailors being sailors the rations were often gulped down prematurely leaving them little recourse but to drink the algae ridden water. The solution was to dilute the mixture with water which stretched the rations for a longer duration. Initially a maritime drink it is found all over Europe and the Western world. It is documented to even have an equivalent in Fuji, no doubt unintentionally introduced by seamen on shore leave. Regardless, the New England variant was a combination of vinegar, honey and occasionally alcohol. The ratio of ingredients shows a dichotomy at work; bitter and sweet made palatable by a jigger of alcohol (exact amount may vary). Of course, the honey has a dearth of nutritional goodness and the alcohol can lull the sick and afflicted into a nice slumber. I believe the vinegar might give the illusion of a medicinal wheelhouse. If it doesn't taste bad then it's probably not helping. This explanation is the HOW. This is what it would tell us empirically, scientifically. But to the those drinking the grog it is only the WHY which is important. The disparate properties jumbled together work because they work together well. This is maybe over simplified and tautological but it led me to continue to extrapolate on pre-literate societies and their ethnobotanical remedies. A healer or a shaman or a witchdoctor in a pre-literate community has a mind numbingly expansive knowledge of his or her immediate pharmacopeia. Much like the New England grog maker, the healer, shaman or witchdoctor mixes and blends a variety of plants, roots and herbs and often hallucinogens to aid in the recovery of a ailing tribesman. The chemistry, biology, and scientific underpinnings can be studied and understood giving us the HOW the remedy worked. That doesn't satiate a cosmology where the profane and sacred are inexorably intertwined. The need to complete the whole must have a WHY. Those pre-literate societies might assume that a deity is embodied in a plant or root and through a concisely dictated ritual resulting in drinking the liquid, a spirit is released which goes forth and heals. The WHY doesn't negate the HOW. It forms a set; an ethical circuit which satisfies the sacred and the profane and ipso facto brings structure. This allows for an individual within a society to experience moral cohesion below the surface tension of empirical reality. How and Why are therefore cut from the same cloth but remain in the western world at odds with each other. For example, take the words demonstrate and inspire. Etymologically demonstrate is taken from Latin meaning “de = proove/monstrum = divine, sacred” but it has been bastardized into meaning empiricism: science. Inspire derives from the Latin word inspirationem which connotes breathing. At its root it incorporates the word spirare which is where we get the word spirit. The act of blowing and inhaling would allow us to ingest the sacred. So are science and mythology doomed to be at rivaling ends of our ethical world view? We can stoically marvel at the universe and proclaim that there must be some sort of intelligent design for such complex sequencing of DNA as proven in the multi-celluar life forms we call humans. There are, however, numerous flaws in the design which make me reluctant to believe in an omnipotent and benevolent greying old man perched on a cloud who's counting the number of fire ants who die in order to keep the biosphere in balance. The fact that life is sustained by killing seems to me to be a major flaw. Science supplies us with a progression of replicable hypotheses which allow us to comprehend the HOW of evolution. They tell us what mechanisms are at work selecting certain traits. Which of these traits may be helpful in the long run but also which ones are benign or antique but continue to be passed down from our homo sapiens ancestors who first interbred with Neanderthals. Like the archaic genes for small brains or the still valid but rapidly fading gene for red hair. The total of nature's wonders in the vastness of diversity on this blue marble or the greater cosmos, either perceived or theorized like dark energy and dark matter, causes me to add credence to Spinoza's view God and the divine. 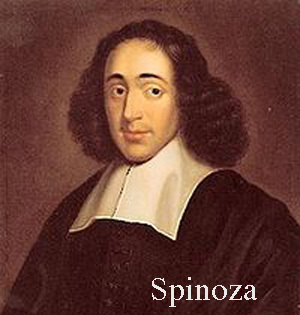 Spinoza theorized a God who exists and is abstract and impersonal. The nutshell of Spinoza's believe in God is that the profane and the sacred are one in the same and exemplified by nature. All the cosmos and all the terrestrial beings are part of a God who is the sum of the universe and nature and not of a guardian overlording it. Spinoza was, uncharacteristically for the Jewish faith, excommunicated because of his heretical philosophy. Thankfully he was able to fused together the HOW and the WHY eloquently and holistically and in a neat and tidy philosophy; albeit posthumously. If we accept the union of the sacred and the profane as being equally beneficial to our moral and ethical development we can begin to pose more stringent philosophical questions. When we ask ourselves one of the quintessential philosophical question : “what is death?” Intrinsically and by default the HOW alone becomes moot and irrelevant. The WHY usurps our self-reflective brain power and takes over the philosophical high ground. Will it be that the sacred provides us with solace not only in preparation for death but also moral support for those we leave behind? Science is not devoid of its WHY deliberation. Let's assume that most of the educated population believes in the Big Bang theory. In doing so we a priori concedes that we are all made from the same interstellar flotsam and jetsam that was spewed out over the universe at the moment of the Big Bang. If we agree to those two criteria then the WHY for science becomes easy. We humans just as all organic matter will return to the cosmic dust fragments from whence we came. Bridging the gab between the HOW and the WHY will make the derisive camps of the profane and sacred irrelevant and at the same time reduce a heap of metaphysical stress on all of us.